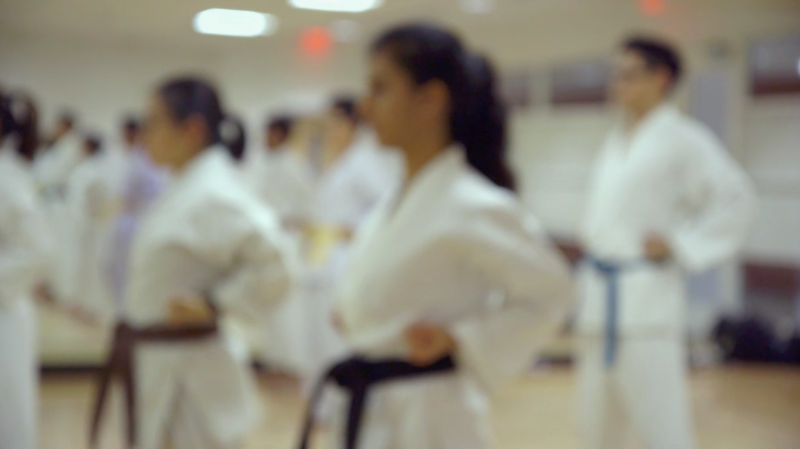 Club members spend much of their time practicing katas, set sequences of kicks, punches, blocks, and other fighting moves that must be memorized and executed to perfection. “It’s about using 100 percent of every ounce of power that you have and throwing it with perfect technique through your fist or your leg into your opponent,” she says. As a martial artist of over 40 years, I can tell you that the fists shown in the video clearly indicate lack of training and lack of real life application. Anyone who throws a punch without a proper, tightly closed fist will break their hand, and will not deliver the blow with any substantial impact at all. Although martial arts has become more popular than ever, I have found that it has become lost to the business world, whereby complex belt rankings have been put in place and are awarded to quickly, all with fees attached. Black belts are even dished out to individuals, most notably children, without any sparring activity at all. The concept of a black belt being an individual that can easily defeat one or many opponents with ease as a result of years of practice and discipline is completely lost. With that said, I still encourage the training, regardless of the changes that have taken place with the art of the years, and I’m glad the exercise and spirit of martial arts is having a positive affect on those engaged, after all, in gun toting America we are all better off to walk away from a fight anyhow. Would like to disagree with your point on ” Anyone who throws a punch without a proper, tightly closed fist will break their hand, and will not deliver the blow with any substantial impact at all”. The Japanese Pancrase tournaments did not allow striking with a closed fist, yet the open hand strike would knock out many a fighter. It is about power and placement. I do agree with your points on belts being awarded to children and adults without any sparring ability whatsoever. You are referring to an open palm strike, not a strike with a 1/2 closed first, big difference there. However, I do see the point about this is nothing but a warm up. Also, don’t delude yourself about the knockout, or about Karate in general. World Champion Chuck Norris travelled to Brazil in the late 1970s to learn styles there, study, and enhance his skills. He was introduced to Gracie Jiu Jitsu where he publically admits to having been defeated by a teenager, the very teenager who went on to win 3 of the 4 first UFC Ultimate fighting championships, that being Royce Gracie. He was so impressed with how easily he was defeated that he hosted the Gracie family in the US in the early 1980s and brought the style to America, you can still view the grainy film that was made when the Gracie’s demonstrated the effectiveness of the art of Jiu Jitsu and the lack of effectiveness of traditional martial arts, something Bruce Lee had already done some 20 years earlier but people simply didn’t catch on to what Bruce was really doing, they were all too enthralled with his movies rather than the truth of his art. But Chuck Norris trained with Bruce Lee so he understood the reality of Bruce’s teachings. Sticking to and mastering a specific style is counter productive, and everything people thought they knew about Karate has changed dramatically in the last 20 years. I agree with the comment about traditional arts being lost, but I believe the video shown is simply a warmup exercise in a loop. These shotokan folks train hard. I’ve seen these warmups performed in other styles: The loose fist position and upright stance is a giveaway in this exercise. But look at those knuckles: Someone is putting in their time on the makiwara. Thank you to all traditional martial artists keeping true to your arts. Boston Karate club I love the video! Do you have the long version available? It’s amazing how beautiful the Empi Kata was displayed! Thanks for sharing this passion ! We can see the love of the martial arts inside the eyes students ! Congratulations! The empi shown in the video had really good form. It’s obvious that a lot of practice has been put into smoothening out the kata! It’s great that you guys are finally getting some exposure! I can’t wait to hear more from your club! Funny how self proclaimed karate experts write anonymous comments criticizing someone else’s karate. I was a member at the club 20 years ago and great to see BU Shotokan is still thriving! As an active martial artist, what matter is bringing the joy of training and sharing among peers and families. It does not matter which style is the best or works on street, that’s a conversations of novices. Knowing one style takes a life time or more. After years of training, we are still not good enough. “Karate Sente Nashi” and “On Ko Chi Shin” are the motto of Shotokan Karate from Grand Master Funakoshi and never forget being a humble practitioner.